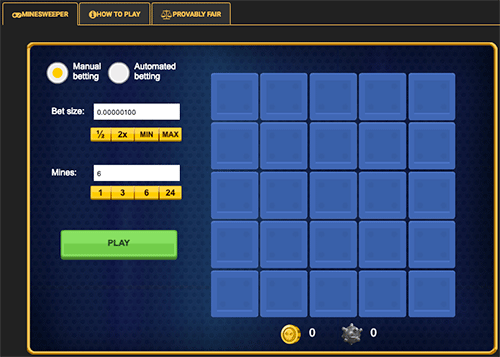 Cool new provably fair casino game on CryptoGames: Minesweeper! 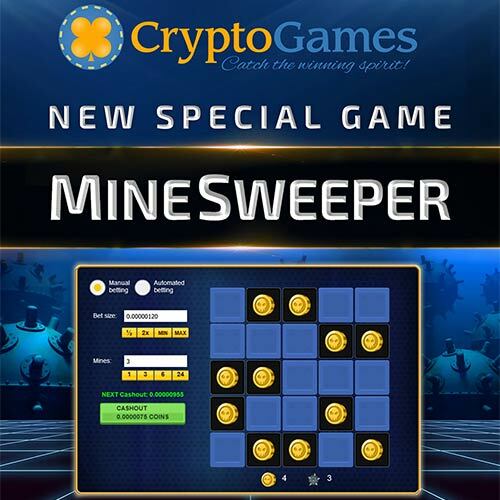 Recently CryptoGames published a cool new classic game revamped to a crypto age: Minesweeper! Who doesn’t remember this old office classic that was standard on Windows operating system. The old classic Windows game: Minesweeper! Now you can play a new crypto gambling version of this old classic. This is how the game looks on Crypto Games. New provably fair Minesweeper game on Crypto Games. 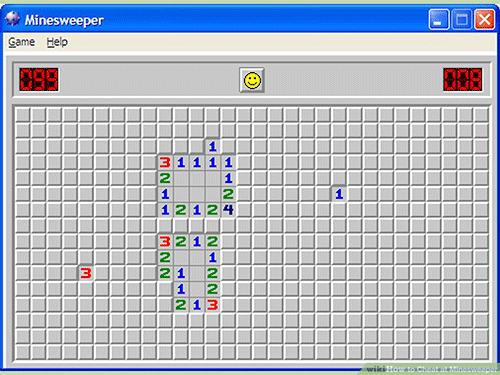 Minesweeper is a simple game, click on as many boxes on the play field as possible without hitting a mine. You must sweep the field for mines, hence the name ‘Minesweeper’. Set the amount you would like to wager using the ‘Bet size’ box. Set the number of mines you would like to place on the field. The minimum number of mines is 1, the maximum number of mines is 24. The more mines you have on the field, the higher the payout will be. Once these have been set, press the ‘PLAY’ button. On the field, click the squares that you believe don’t have a mine in them. Once you are done clicking on squares, press the ‘Cashout’ button. If you hit a mine, you lose and your bet is taken. The accepted bets must have a profit smaller than 4 BTC (maximum win per bet), this means your game will not be allowed to uncover additional fields, if your pending win would go over this threshold. Why not go test this new game out and please write your experiences here or to the CryptoGames review. Read the Crypto-Games review here.